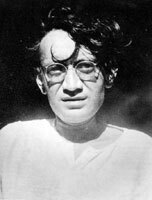 Due to his stature and a media image that suggested provocation, Saadat Hasan Manto, the leading fiction writer of Urdu, has been a subject of great interest for both serious students of literature as well as those interested in poaching on the personal life of a public figure. Faheem Shanas Kazmi has tried his hand at all poetic genres for more than two decades now. Two collections of poems are already in the pipeline. Khwaab Se Baher is his recently published book of ghazals. He is among those poets who have rejected the meaningless compartmentalisation of art forms and instead he follows the dictates of his creative self. The heated debate and dismissal hasn't harmed the ghazal but has definitely transformed its perception in the minds of authors. Consequently we don't find a ghazal sticking to the customary traditional format nor has it jumped away to become a non-serious "anti-ghazal." Instead Kazmi uses classicism and modernism to make a beautiful blend. It is part of Muhammad Ali Jinnah's greatness that more than 60 years after his death, he remains a controversial leader. Many admire him as the founder of the first Islamic state in the modern world. Others remember him as the westernised liberal and secular leader who wanted various faith communities to live peacefully in India. He demanded Pakistan, they believe, only as a bargaining counter but was pinned down to get it "on a platter." Jinnah is also described by some as a religious bigot who hated Hindus and got India divided on religious basis. As Manto treaded on subjects considered to be taboo, some of his writings were banned and there had always been a lurking possibility that much never saw the light of printing. These could have been due to either exercises in self restraint or the inability of finding publishers who were unwilling to take any risk in view of the pressure from certain quarters. The first serious attempt at collecting the works of Manto done by Sang e Meel in 1990 was titled Mantonama, Mantorama, Mantonuma, Mantokahanian and Mantodrama. Later in 1998, another volume Manto Baqiyaat too was added to this long list by the same publishing house. This attempt though creditable -- this was the first serious effort at collecting the works of Manto -- was not done by any research scholar nor were the standards rules of indexing and referencing followed. It could not be taken as a well-researched work but only as material on which further research could be carried out. Among other attempts, Humayun Ashraf from India on the fiftieth death anniversary of Manto published Kulyate Manto in six volumes for Educational Publishing House, Delhi in 2005. It had writings of and about Manto and seemed to be a joint effort of Humayun Ashraf and Wahab Ashrafi. The first three volume contained Manto's afsanas and the other three his articles, sketches and plays in separate volumes. In the three volumes of the afsanas Wahab Ashrafi had written critical essays titled muqaddama while the preface and the biographical details and works were by Humayun Ashraf. The listing of the works of Manto followed an alphabetical order, while after each piece the date as well as the name under which it was initially published was mentioned, this was important information because many writings of Manto had been published with different names and titles over the last half century. Kulyat e Manto was poorly subedited and there were other lapses like lack of proper indexing and referencing, but despite all these flaws it had more material than the one published by Sang e Meel as it included four new afsanas, "Phoja Haram Da", "Surma", "Mehtab Khan" and "Begum Sahiba". These were not unpublished works but were absent in the collected works by Sang e Meel. Another effort by Dr Shamsul Haq Usmani had been made under the auspices of Farogh e Zabaan e Urdu, New Delhi. He had followed the chronological order for the published material while writing in detail about the pieces which have been published a number of times and with different titles. Nigarshaat also published Baqiyaat e Manto last year with its compiler Khalid Arman claiming that it included unpublished material but it was far from true. In 2005, Nigarshaat also published Manto Ke Afsanaey in two volumes which more or less carried the same articles and works that had been published by Sang e Meel. Dr Sana Bokhari, who did his doctorate on Manto in 1984, had his thesis published as a book in 2006. Subsequently, a few other writings were also published. Muhammed Saeed on reading certain writings of Manto like Tamashaga e Nafas, Sangtarash ka Roznama and Gulab Ka Phool in Mohammed Hasan Askari's Urdu Adab realised that some writings of Manto had still not been published in any collected works or elsewhere. He and his team-- that included Muhammed Saeed, Shamsheer Haider Shajr and Naveed ul Hasan -- set out to research on the possibility of unpublished writings of Manto. The team followed the standard practice of first collecting the entire works of Manto, then with editorial discretion, listing these in a chronological order with the corrected/edited text. This book had been the consequence of that research. Nawadarat e Manto thus includes sixty writings of Manto. When the team started work none of these were published, but some had been during the time taken up in their research, though still many have been published for the first time. These probably had not been edited in a chronological order, rather divided under writings and translations of Russian and French literature. It is clear that Manto was introduced to world literature through his passion for reading and the large number of translations that he did. He was thus eminently placed to introduce many more themes to Urdu literature which were not tapped earlier. He was original and only wrote on what appealed to his creative fancy. He thus could not be slotted into a cut and dried category like being a progressive or a modern. He had strong affinities with the progressives but found their dos and don'ts too inhibiting for original writings. Similarly he did not fully subscribe to the modernists who were more concerned about matching their wits with the progressives rather than creating or preparing ground for seeds of literary originality. This volume, a valuable addition to the research on Manto, will help in casting a light on the real Saadat Hasan. He has been uncomfortably placed in Pakistani literature. He did not fit in totally with the mould created by the Progressive writers, not did he conform to the defined parameters of Pakistani literature. Muhammed Saeed who teaches at the Government College now University had rightly pointed out that in order to critically evaluate a writer his complete works should be taken into account. Unfortunately in our country critical opinions have been based on patchy and sketchy knowledge. This work is commendable for it attempts to do just that. Kazmi's poetry is one example of balance, where he neither tries to be too modern nor immensely conventional. What one discovers in him is a sensibility that is both contemporary and relevant and a vocabulary tailored to the demands of such an expression; technically he hasn't taken liberties and remains within the ambit of the prescribed decorum. One may infer that instead of showing a display of vocabulary, he has remained far more faithful to the thoughts, ideas and experiences he intends to communicate. This quality has taken his ghazal quite close to nazm in mood and temperament. In the essay included in the book, Khawja Razi Haider observes that a poet doesn't matter as such. It's the sensibility that grows within him to create a sort of "soul" which gets expressed finally in the poetry. This soul dictates the poet. Senior poet Raja Chughtai witnesses a continuous evolution of Kazmi and firmly believes the ghazal to be a luminous work reflecting the glow of the entire tradition of Urdu poetry. Mohsin Bhopali, a celebrated poet, finds in him a vision which relates his personal existence to the life in totality where Kazmi addresses the question of being and nothingness. Kazmi's diction remains peculiar to him alone, Bhopali observes. Kazmi's dilemma stems from the conflict of a struggling, resourceless individual fighting for a place in a throbbing compliant city, unfriendly and hostile to all such persons. He sinks into the abyss of worthlessness as a consequence. Added to this is his own subjective crisis outlined by nostalgia and an exile which keeps haunting him in an alienated life. He recalls his past and returns from "him to him" as a refuge. A persistent longing for love and a shelter like home never leaves him. It is here when Kazmi becomes more effective and captivating as a poet. He advances and is disillusioned. He retreats and gathers himself again to advance once again. He struggles to stop struggling one day. Kazmi's analysis of the human situation is immune from illusions -- still one can't miss a denting tinge of melancholy and composed frustration. 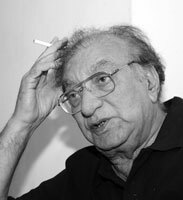 Although Kazmi is hard to isolate from most of his contemporaries writing today, one discovers a few exceptionally brilliant things in his poetry which may guide him to attain a status of a unique modern poet. Aftab Iqbal Shamim is a poet of immense significance who unfortunately has never been systematically studied nor his placement ever been critically evaluated. Writing now for almost five decades, he remains isolated and a lone dreamer, but continues with an untiring zest and competence to produce some fascinating poems. His recent book Mai Nazm Likhta Hun is dedicated to poets (Nazmlilkhnay walon k naam). In order to understand his stance as a poet, we need to consult the preface of his earlier book Zayd Se Mukalma, (1982) where he speaks about his own perception of art and the human situation. He advocates that we must break the chains of illusions of all sorts and push the oppression and exploitation out of our lives. He sounds deeply disturbed and rebellious against the exploits of the powerful and the miseries of the oppressed. Accepting the absoluteness of his existence with all its limitations, he refuses to consider life as absurd or meaningless. He enjoys being the part of this magnificent universe. As a poet, he reflects: "Zayd is my absolute truth while I am a half truth in myself." In Zayd Se Mukalma, he not only identifies himself but his reader and mankind in general. His recent poems fall in line with his previous work. He is essentially a progressive intellectual adhering tenaciously and faithfully to what he has always believed in. His tone is mild and penetrating while majority of his poems remain brief to the extent that one is compelled to feel that he isn't ready to stretch beyond this length, although a few long poems are already to his credit -- a couple are included in Mai Nazm Likhta Hun. Modernistic in essence, he weaves his poems in a complex fabric and remains indirect and symbolic. One hardly finds a theme, a battery of metaphors or linguistic treatment repeated strikingly to be identified as characteristic of his individuality. His poetry talks of the cosmos, universe and its end, scientific advances, information explosions and recent global developments and relates all this to the human situation. Along with an expression of longing for love and tenderness, one finds authority of reason and objectivity too. This painful awareness of his triggers an intense demand for inauguration of an age of stability and reason and an emergence of a world where humans can live in accordance with their dreams. With rich vocabulary, modern sensibility and unpolluted individuality, Shamim remains unparalleled as a poet whose significance is bound to be acknowledged. History has not decided his case for the simple reason that no objective or impartial history has been written in our corner of the globe. History is written here in the backdrop of religious prejudices, national feelings and vested interests. Hence different groups of the region have continued to view Jinnah from their respective points of view. Many of us were pleasantly surprised by L.K.Advani, leader of the Hindu fundamentalist Bharatiya Janata Party, when in 2005, he declared Jinnah to be a modern secular leader and counted him among the very few who really created history. Advani's statement was not liked by his party. Ignoring all his services for Hindutva, he was made to resign from the presidentship of the party. It seems that Jinnah's attraction to BJP leaders refused to subside with Advani's punishment. 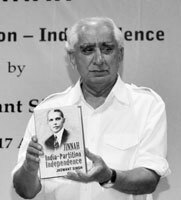 It was now Jaswant Singh's turn to stand up in admiration of Jinnah. He is an eminent founding member of BJP and has served his country as foreign minister. In the third week of August he published Jinnah's political biography under the title Jinnah: India, Partition, Independence, describing Jinnah as a modern liberal leader who would have preferred to keep India united. The book infuriated his comrades to the extent that they expelled the author from the party over the telephone without giving him any opportunity to explain or defend his point of view. But Jaswant Singh has written nothing new. In fact, many Indian scholars and historians have already exonerated Jinnah from the superficial charges of fanaticism and narrow-mindedness. Explaining BJP's reaction to it's member's audacious views about Jinnah as yet another example of Hindu bigotry is quite easy. But while doing so, it should be kept in mind that the party's action was widely condemned in India where dozens of articles, columns and editorials have been published defending Jaswant Singh's right to express his opinions. Our writers and intellectuals would do well if instead of joining the chorus of censuring Hindu narrow-mindedness, they take pains to explain why we have not produced a Jaswant Singh. If you have not heard the name of Khalid Toor, it is because he always keeps his distance from literary events and has not written much. Many long years ago, in 1966, his short story was published in Ahmad Nadeem Qasmi's Funoon under the title Saeen Mausam. A quarter of a century later he came up with a novelette Kani Nikah. Khalid Toor was then serving as a producer at the Lahore station of the Radio Pakistan. I have read both his story and the novelette more than once and consider them exceptionally fine literary works. I was therefore, much pleased to find both the writings reproduced in the current-issue of the Karachi based literary journal Aaj. But Aaj also carried some other thought-provoking articles and valuable literary pieces. For instance, it includes the thirteenth instalment of the Urdu translation of Ralph Russell's autobiography Losses, Gains. The translation has been made by Arjamand Ara. No less worth reading is a short story, Aik Murda Sar ki hikayat, penned by Sajid Rasheed. Aaj is edited and published by Ajmal Kamal. The first death anniversary of Ahmad Faraz passed silently in Lahore in the last week of August. None of the literary groups thought it proper to pay tribute to the poet who surpassed all his contemporaries in popularity and fame. Some of the poet's friends and representatives of literary organisations of his adopted twin cities of Islamabad and Rawlapindi, however, did visit his grave to pay their respects. A newspaper report has now revealed that Ahmad Faraz Trust was set up in Islamabad on the occasion of his first death anniversary. The poet's son Shibli Faraz, Barrister Masud Kausar, Agha Nasir, Masud Mufti, Ataul Haq Qasmi and Mahbub Zafar are the members of the trusts. They announced to institute an "award for the best book of poetry with a value greater than all the current monetary awards". The holding of mushairas has also been included in the trust's agenda. Ataul Haq Qazmi has rightly pointed out that the Ahmad Faraz Trust should primarily focus on the promotion of dissent and freedom of expression, the values Ahmad Faraz stood for and which endeared him to millions in the country.